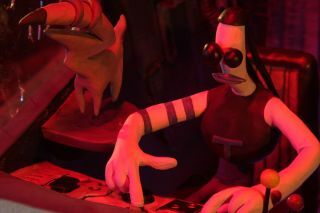 Doug TenNapel's claymation-like adventure game Armikrog successfully crossed the Kickstarter Rubicon in June 2013, and while the estimated July 2014 delivery date came and went uneventfully, the studio announced today that the Neverhood-style adventure game will be out on August 18. There's a new trailer, too, narrated by Rob Paulsen, the voice of Beak Beak, a pointy-nosed dog/alien creature who accompanies the game's hero, Tommynaut, on his journey—a journey that's cut short when their spaceship crash-lands on a strange, alien world. The game is being developed by Pencil Test Studios, an indie outfit founded in 2013 by TenNapel, Mike Dietz, and Ed Schofield, who previously worked together on Earthworm Jim and The Neverhood. "The Pencil Test team have created a hand sculpted, stop motion game fans young and old will enjoy. Every hand-crafted detail of Armikrog is beautiful, funny, and rich," Steve Escalante, general manager of publisher Versus Evil, said. "It is a true compliment to what indie development teams can accomplish when they have a strong vision." I wasn't sure what to make of the game at first—I missed out on The Neverhood—but based on this trailer, I'm now really looking forward to it. Find out more at Armikrog.com.